With a half-mile to go, my son asked if I wanted to cross the finish line holding hands. My eyes welled up with a grateful “Yes!” and I knew that today I would finish strong with Ian by my side. As a new runner, I’m still humbled by the difficulties I face running, both physical and mental. He filled me with energy, hope, and love. As a new runner, I’m also still in awe of those who can run faster, farther, and smarter. Finish a 5K in 15 minutes?! Bravo! And I’m overwhelmed to consider the stories of those who race with giant hearts that overcome obstacle after obstacle. Cancer survivors, their loved ones, and those who ran on behalf of those who passed away, inspired me to keep going and give it my best. I am so proud of the growth of this event. All of our initiatives are meaningful and have great impact on the community, but this may be the most significant. Everyone knows someone who has been touched by this dreadful disease. These funds will go toward research, treatment and education as we look to save lives and find a cure. My own foundation, the Derrick Hall Pro-State Foundation, is a beneficiary of the generosity of everyone running and walking. Being a cancer survivor myself, I thank everyone from the bottom of my heart. I want to thank everyone, all 2,000 participants, too. Joining together as a community, we filled each other with energy, hope, and love. We made each other better. At the finish I learned that I had run my best 2-4 miles, a 9:23 min/mi pace. For added fun, I heard one of our favorite former D-backs, J.J. Putz, finished after me. He was likely running as part of a team yet I laughed out loud and high-fived the runner next to me. For the rest of our lives we can say that we beat J.J. 🙂 I was “this close” to getting a picture with him but I had a newbie post-run disorientation! Thankfully, my family helped me out of my confusion and a victory lap around the warning track of Chase Field was icing on the cake. 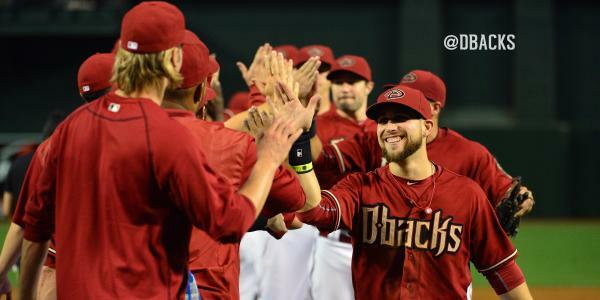 When the Arizona Diamondbacks win a game, we hashtag #SlapHands on Twitter. Today, I was privileged to #SlapHands with 2,000 winners. Do you participate in events to raise funds for important causes? Do you run or walk in events? What charities do you support? This entry was posted in Challenges, Community, Family, Fitness, Lifestyle, Performance, Relationships, Solo, Sports and tagged Arizona, Baseball, Family, Phoenix, Running. Bookmark the permalink. Congratulations!! I support MS fundraisers, but unfortunately I am not able to run or walk for long distances. Good for a few of my friends that run for me in races in Charlotte. Congratulations Angie great finish and goal of supporting the organization – cancer awareness is one that never leaves. I’ve run for Ronald McDonald House – an awesome organization that I love being a part of. Have a wonderful week ahead, you should take a bow for your finish!! Congratulations – well done and wonderful achievement! Thank you, Mihran ❤ Have a beautiful day! Congratulations, Angie! A great cause, and you shared the experience with your son. He won’t soon forget it … you may be going to a lot of races in the future!